CHICAGO – “Damages” is back for its fifth and final season and there’s every reason to believe the award-winning show is going to end on a high note given the strength of the first two episodes of this impressive final arc. We’re finally going to get what we’ve been dying to see since the amazing first season — Patty vs. Ellen in a court of law. The fourth season of “Damages,” recently released on DVD which I’ll get to at the bottom of this review, was kind of a mess. It is easily the worst of the four complete seasons so far and I actually had low expectations going into this final outing. While there are individual elements that work in season four, particularly Chris Messina’s performance in the first few episodes & the continually strong work by Rose Byrne and Glenn Close, the plot writing was disastrously paced. It didn’t help that the structure of the season forced most of the characters apart for the majority of it. It felt like the pacing was just off as the show transitioned from FX to The Audience Network. It seemed unlikely that they would figure out how to correct the problem for the fifth season. I was wrong. The first two episodes of season five are better than anything in season four (and much of three for that matter). The crisp, fast-paced sense of plotting that was missing from last season is back along with the willingness to take risks in terms of storytelling. The climax of the premiere of season five of “Damages” is a stunner, the kind of moment that works within the plot (and so doesn’t feel sensational) but gets people talking the next day. “Damages” has become well-known over the years for major league guest starts and this season is no exception. Chris Messina returns at least at the start of the season and so does Judd Hirsch, a character who seems much more well-defined this year even in just the first two episodes. They’re joined by Ryan Phillippe, Jenna Elfman, John Hannah, and Janet McTeer. Phillippe plays the main client, the mysterious figure behind a WikiLeaks-type website who finds himself in the spotlight when a whistleblower (Elfman) ends up having her privacy blown when she tries to do the right thing. Not only is her identity revealed in a world where privacy is essential but so are personal emails that detail sexual escapades. Did she send the personal material mistakenly? Was it purposefully released? To what end? It would spoil major turns to say how this ends up in a court of law with Ellen and Patty on either side, but that’s where we are by the end of episode one. And it’s a great place to be. If we’ve learned anything over four seasons of “Damages,” it’s that more of the action of a trial takes place outside of the courtroom. So as Patty and Ellen try to play mind games with each other, particularly in the great second episode, one realizes that this battle is going to be epic. And it’s likely to have some collateral damage. I’ll be there for every twist and turn. As much as I really like the start of season five of “Damages,” I kind of hate the fourth season, recently released on DVD. As I mentioned, it’s a mess tonally and often just plain boring. However, the show is best appreciated if you’ve seen it all. There are characters set up in the fourth season (Messina & Hirsch) along with the development of the very important custody battle for Patty’s granddaughter and those are going to be a factor in season five. So, in recommending season five, I think it’s important to see season four. Sadly, the DVD set is just OK with very mediocre transfers. The episodes often look too dark and poorly mixed, although it’s hard to tell if that’s shoddy filmmaking or mediocre transfers. 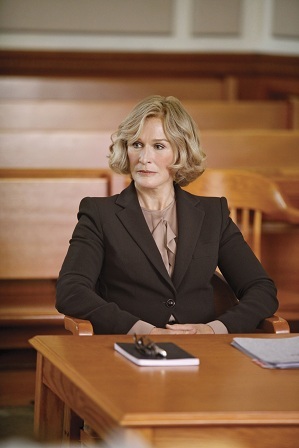 For brilliant attorney Patty Hewes (two-time Emmy winner Glenn Close), the stakes have never been higher, professionally or personally, in the riveting Fourth Season of the hit legal thriller. When Patty joins Ellen Parsons (Rose Byrne) to expose a corrupt security firm in Afghanistan, they unravel a cover-up at the highest levels involving an inscrutable mercenary agent (Dylan Baker), a key witness taken hostage (Chris Messina) and the powerful CEO (double Emmy winner John Goodman) with his own explosive secrets. It all comes down to one final, fatal double-cross. “Damages” returns for its fifth and final season on The Audience Network on DirecTV on Wednesday, July 11, 2012 at 8pm CST and the fourth season was released on DVD on June 26, 2012. The fifth season of “Damages” stars Glenn Close, Rose Byrne, Chris Messina, Judd Hirsch, Ryan Phillippe, Jenna Elfman, John Hannah, and Janet McTeer. The fourth season also starred John Goodman and Dylan Baker.